Head On Over to Deadwood For The Geek Deal of the Day!!!! Todays Geek Deal is one of HBO’S best tv series. 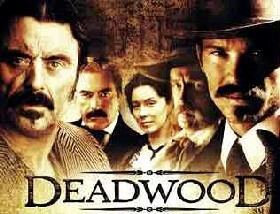 I’m of course talking about the badass western, Deadwood. For today and tonight only, the entire series is on sale in the formats of bluray and DVD. They are selling for 59% off their normal price tag bringing the bluray down to $85.49 and the DVD down to $61.99. Those are excellent deals. Boomstick Giveaway: HBO’s ‘True Detective’!! This entry was posted on Thursday, February 3rd, 2011 at 3:12 pm	and is filed under News. You can follow any responses to this entry through the RSS 2.0 feed. You can skip to the end and leave a response. Pinging is currently not allowed. « Have Some More High Res Images of Captain America: The First Avenger!! !